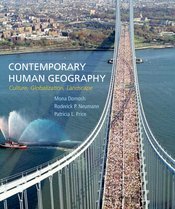 More than any other book for the introductory human geography course, Contemporary Human Geography shows what geographers actually do—how they conduct research, develop new insights, teach us about the world from a geographer’s perspective, and apply their skills in a wide range of academic and professional pursuits. With each chapter organized by five themes (mobility, region, globalization, nature-culture, cultural landscape), Contemporary Human Geography introduces students to fascinating topics such as vampire tourism, the rise of the LBGT districts, texting and language modification, and more, continually reinforcing the geographers’ contributions of geographers to our understanding of how we live in the a globalized modern world. The authors structure this coverage around specific learning objectives, to help students focus on essential concepts and prepare for class discussions, assignments, and exams. Contemporary Human Geography can be ordered with W.H. Freeman’s breakthrough online course space, LaunchPad, which offers innovative media content, curated and organized for easy assignability, in an intuitive interface that combines power and simplicity. To order this book packaged with LaunchPad please order package isbn 978-1-319-01716-3.